The Pathfinder Roleplaying Game: Beginner Box Player Pack provides new character creation options for Pathfinder players, including a complete player character class: the powerful berserker known as the barbarian! Kit out your character with tons of new adventure gear and alchemical items, dominate combat with new feats and spells, and spruce up your character with new class options for clerics, fighters, rogues, and wizards! Take your Beginner Box characters to the next level with these exciting tips and tricks! 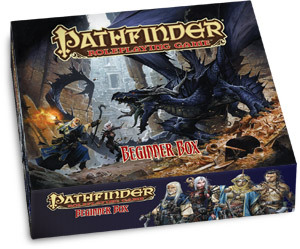 The Pathfinder Roleplaying Game: Beginner Box GM Kit arms Game Masters with new options and opportunities, from a complete adventure that picks up where the Beginner Box's Black Fang's Dungeon, left off to new monsters like the deadly minotaur and the giant black widow spider! Piles of new magical weapons, armor, and other treasures beef up your campaign's rewards, and tips on converting standard Pathfinder adventures for use with the Beginner Box extend the life and variety of your Pathfinder campaigns. 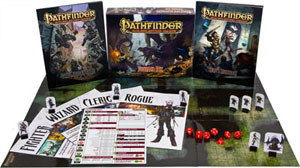 Step beyond the Pathfinder Roleplaying Game: Beginner Box into the complete Pathfinder Roleplaying Game with Pathfinder RPG: Beginner Box Transitions. In this free document you’ll learn how to read and understand new facets of the Pathfinder RPG rules, advance characters to 6th level and beyond, and unlock the entire arsenal of Pathfinder RPG adventures and accessories. New guidelines also allow you to adapt dozens of Pathfinder RPG adventures for use with the Beginner Box. Unlock a world of unlimited adventure with Pathfinder RPG: Beginner Box Transitions! Four mini-adventures, specifically designed for use with the Pathfinder Roleplaying Game Beginner Box. These adventures allow a GM and players to expand their experience of the Beginner Box. Each of the included adventures revolve around Sandpoint and are set in four different areas of Varisia. The adventures can be run as a sequel to Black Fang's Dungeon found in the Game Master's Guide. Ready for the next step from the Beginner Box? This guide provides a step–by–step walkthrough of the Pathfinder Society character creation process while referring you back to the Hero's Handbook. These instructions allow for a seamless transition from the Beginner Box to Pathfinder Society play. Download this colorful two-sided character sheet to record every detail of your custom hero, from ability scores and skill bonuses to weaponry and treasures. Special sections help you record your character's triumphs, including monsters killed and most damage dealt! Jump right into the action with this helpful pregenerated character packet! Take on the role of Valeros the fighter, Kyra the cleric, Merisiel the rogue, or Ezren the wizard with these digital copies of the 1st-level characters included in the Beginner Box. Your Pathfinder experience begins with this introductory boxed set packed with rulebooks, dice, a reusable Flip-Mat play surface, and more than 80 character and monster pawns. 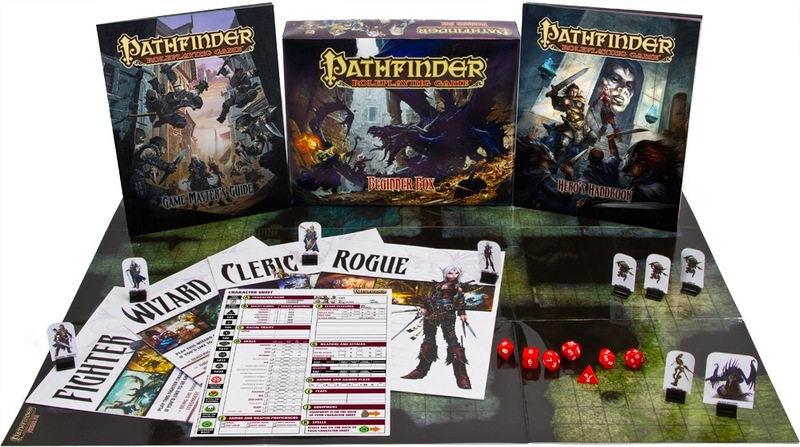 Simplified rules and enhanced graphic presentation make the Beginner Box the ideal introduction to the exciting world of the Pathfinder Roleplaying Game! Bring an exciting new dimension to your Pathfinder game with these beautifully crafted fully painted miniature figurines representing the iconic heroes of the Beginner Box: Valeros the fighter, Kyra the cleric, Merisiel the rogue, and Ezren the wizard. After starting with Beginner Box Heroes, augment your Pathfinder miniatures collection with the full line of Pathfinder Battles prepainted miniatures. Pledge your allegiance to Pathfinder with this huge poster featuring the gorgeous Beginner Box cover art by fantasy legend Wayne Reynolds! We set aside a limited number of these rare promotional posters, and will send your mint, unfolded poster to you rolled in a durable tube. Available while supplies last! GMs looking for new environments to challenge their players can choose from dozens of Flip-Mats and Map Packs. These maps are designed to work with the pawns in the Beginner Box, and make the perfect inspiration for your next adventure! Check for active gamers in your area by posting to our Gamer Connection forum. Paizo.com hosts hundreds of online campaigns. Check here for an overview of open games and to peek in on active online campaigns. The best way to find Pathfinder Roleplaying Game action in your area is to get involved with Pathfinder Society Organized Play, a huge international Pathfinder campaign with tens of thousands of players. Your Beginner Box knowledge should be enough to get you started in this exciting, ongoing mega-campaign. Join today! Once you've signed up, stop by the Grand Lodge forum to find upcoming Pathfinder Society public events in your area! Paizo publishes Pathfinder, but it's the fans that make the game truly special. Have a question about the rules? Want to share a funny story about what happened at your Beginner Box table? Join the conversation with other Beginner Box players and Game Masters in our special Beginner Box discussion forum! Jul 10, 2018, 10:10 am by T.A.U. — T.A.U. How about a Sandpoint Box? Is Composite Longbow with STR regarded as magic item? [rule clarification] Would "aid another" also start a melee attack? Are there any other pre-gen classes for BB? Handling Animals and smart animals. Lore wise, How to rationalize a 100+ hp character in a 10 hp commoner world? Alignments, alignment subtypes and templates? Any one shots acceptable as a BB follow up? Rolling for skill check questions. What can be considered distrubing to an earth elemental? My first fighter (+ some questions). New player, a handful of questions. Not sure what the (melee) and (ranged) means in relation to attack bonus. Cavalier and non-dead mount replacement. Reasons not to go full anarmed with monk? Anyone interested in creating characters for us? Pathfinder Society: Making a Vampire Hunter....But do Vampires exist on the elemental planes? Black Fang's Dungeon - Player killed Black Fang, help? First adventure with a bunch of RPG noobies! Anyone made any Beginner Box Adventure Map Tiles? Again: can i get a list of feats / traits that will save your life,please? Welcome, new Beginner Box players! making an eidolon. did i do it right? surprise melee attack ..... what does it mean? is Ferocity (Ex) the same as the "Never Stop Shooting" combat trait? what is a "minotaur double crossbow"? Masterwork Transformation is it permanent? by lvl how dig is too big of a dungeons ? XP - lingo going around in circles! what kinda skill is cooking?